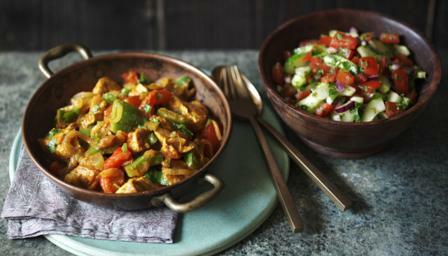 Marinating the meat is the key to this light, jalfrezi-style curry because it provides loads of flavour without adding any unnecessary fat. This meal provides 164 kcal, 21g protein, 13.7g carbohydrate (of which 11g sugars), 2.9g fat (of which 0.5g saturates), 4.1g fibre and 1.4g salt per portion. Combine the chicken with the marinade ingredients in a mixing bowl. Cover with cling film and transfer to the fridge for two hours, or overnight if possible. Add the tomato purée to the chicken, stir through to mix and cook for two minutes. Add the stock, bring to the boil then cook for 10 minutes to cook the chicken through. Meanwhile for the cachumba salad, combine all of the ingredients in a bowl. Season to taste with salt and set aside. Taste the chicken and adjust the seasoning as necessary. Add the tomatoes, stir through and cook for 5-10 minutes, or until the sauce is thickened and flavoursome and the tomatoes softened. Remove from the heat. Garnish with chopped coriander and the remaining chopped chilli and serve with rice.